I've been waiting for a decade for Monster Hunter to finally become popular outside of Japan. The secret of Monster Hunter’s combat is that even when you don’t really know what you’re doing, you don’t feel like a clown. 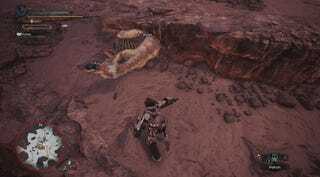 The most inexperienced hunter could still land a couple of hits with a big weapon like a greatsword, even if it takes 45 minutes to fell a monster. Better players can do things more efficiently. The game rewards skill and witnessing a top player at work in a Monster Hunter will likely motivate you to improve. When you see an expert player at work with a glaive or dual swords, dodging away from the tail of a dragon a fraction of a second before it sweeps them off their feet, then retaliating with a five-hit combo... it looks positively choreographed. The things that have been simplified are things that were needlessly time-consuming in the first place... What hasn’t changed is hunting monsters with beautifully balanced weaponry, and that was always the point.